The overall height is visibly a bit taller, but only after I put them next to each other face down, did I actually even notice this. 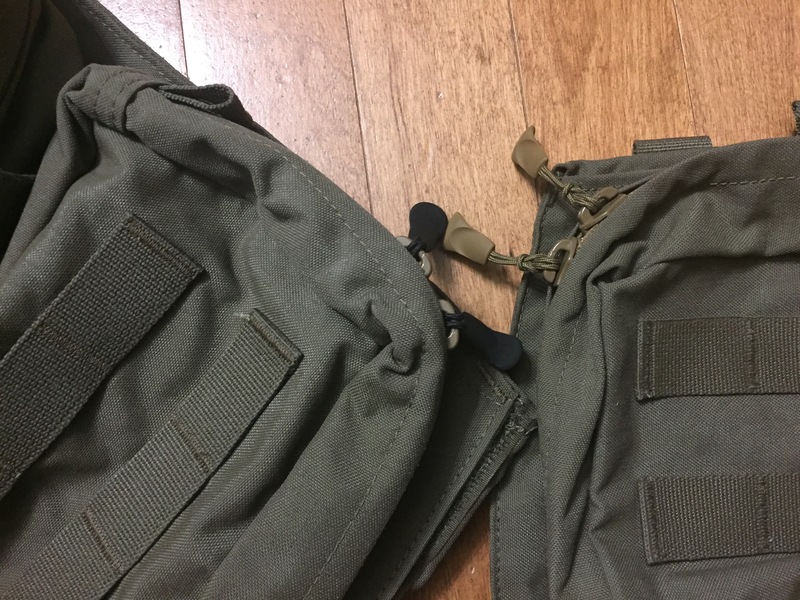 Taking a ruler to these, the distance from the topmost MOLLE snap to bottom stitch on both back panels differs by at best 1/8″ when both are laid flat – surprisingly the Mayflower tagged one is the slightly larger one (as this change was noticeably made in the much more recent HW backed generation of back panels, albeit much more pronounced). Width remains the same, as does my best guesstimate on the other pouches – but as these are harder to measure (especially when empty), I didn’t measure them for comparison. The construction looks near-identical to my eyes – most of the differences I can spot are likely just the result of different production batches. This photo probably shows the more drastic differences in construction between the two that I could find – I promise, it’ll floor you – the bar-tacking looks a little beefier on the one with the Mayflower by Velocity Systems tag, despite the overhanging webbing being bar-tacked on at mere fractions of an inch closer together. Wow, right? Also note that the coating on the inside face of the material is visibly different here – unfortunately, I haven’t done my homework on materials in quite some time, and couldn’t knowingly communicate why one would would be any different than the other. 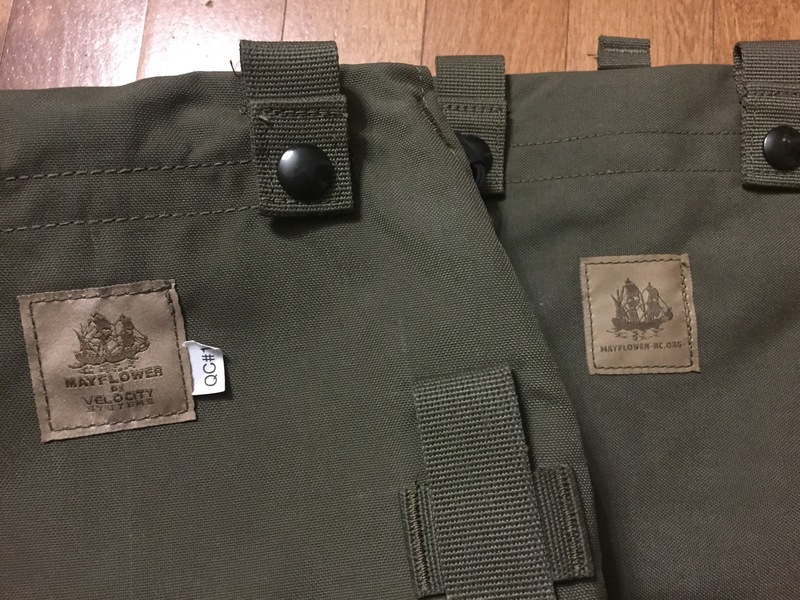 For a lack of any understanding on the matter, the Mayflower by Velocity Systems one has a shinier inside surface on the Cordura materials as compared to the slightly more matte surface on the Mayflower-tagged one. 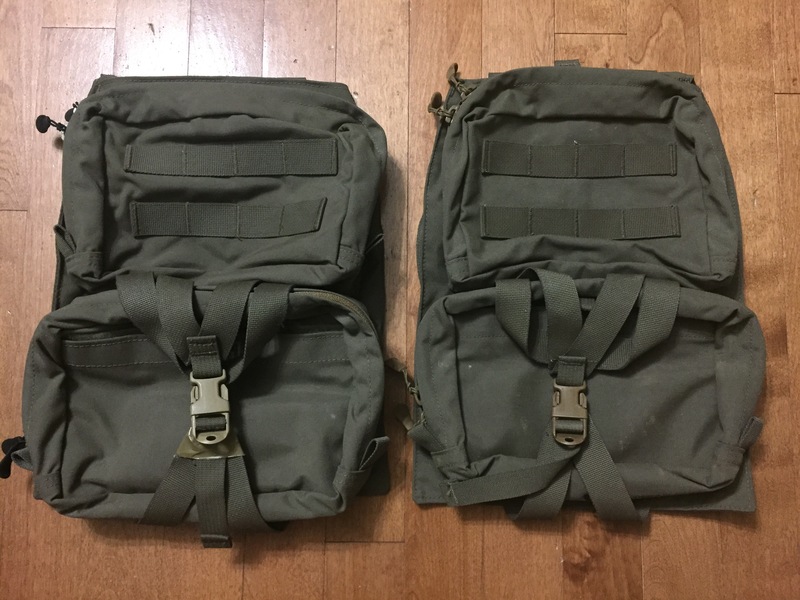 All in all – nothing nearly as major as the changes between these older MOLLE ones and the newer HW ones. … Speaking of the newer HW Assault Back Panels, around a year ago I compared one of the Mod2 HW ones side by side. While the changes are on first glance fairly subtle, they are some fairly major changes to the design that Mayflower may or may not have actually advertised. 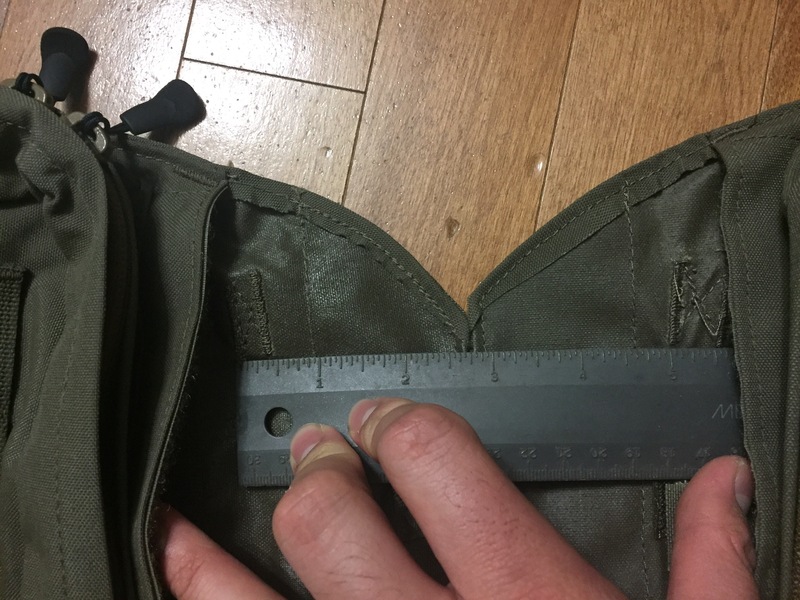 Unfortunately, the super grainy photos of out-of-focus Cordura were lost long ago on a bricked phone, but a quick list of the changes are as follows: hydro reservoir pocket extended (2.5″ longer with rounded corners, presumably to allow for greater compatibility with various taller reservoirs on the market), slightly resized upper GP/NVG pocket (longer by 1/4″), resized & reconfigured tear away medical pouch (including the addition of elastic loops), 2″x2″ square of colour-matched soft Velcro for medical patches to be attached to tear-away medical pouch (i.e. Multicam Velcro on Multicam Cordura, unlike other items from MRC/Velocity Systems), reduced length of overhanging “flaps” that cover the zipper (probably to alleviate the zippers from constantly getting stuck on the flap of Cordura floating over the closure), and – last but not least – the back face of material is the Helium Whisper backing itself instead of Cordura (BFG’s method of attachment that is abundantly advertised as being thinner, lighter and stronger – not noticeably lighter in this case with all the material stitched to the HW backer, but it is significantly thinner when mounted to a MOLLE platform). 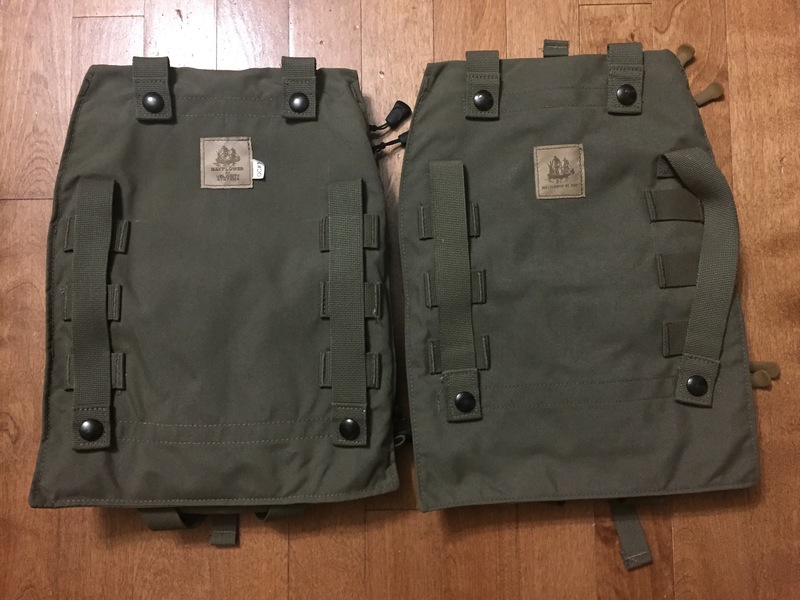 Price point on the new HW Panels is up there now – that, combined with the fact that I already found a hydro reservoir that fits perfectly for my old MOLLE one, I see no reason to upgrade to the newer generation at this time. 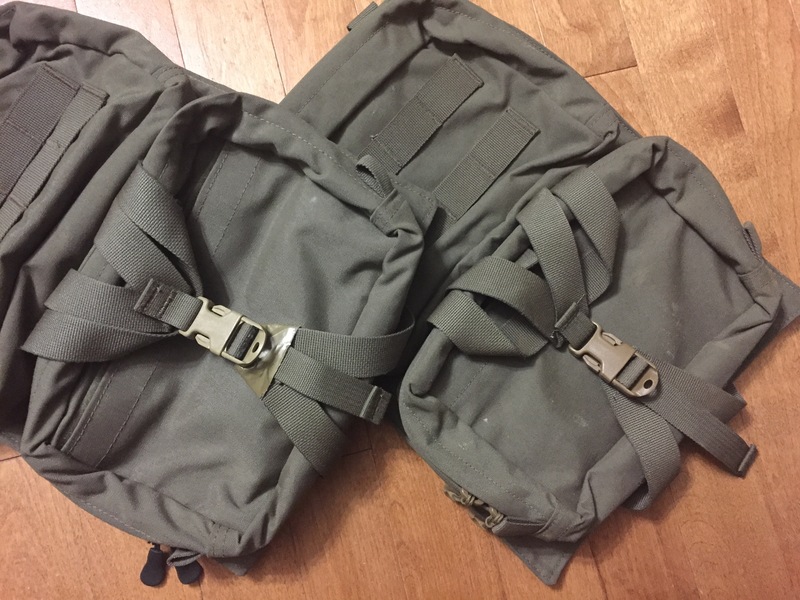 This entry was posted on Monday, October 10th, 2016 at 9:34 PM	and tagged with Back Panel, Mayflower, MOLLE, Rangar Green and posted in Gear. You can follow any responses to this entry through the RSS 2.0 feed.